Earlier this month, I wrote about the Qantas airline grounding all of its flights. Qantas still hasn’t made a deal with their staff so it will now go to forced arbitration (that means that someone tries to help you agree with each other). They were ordered to make an agreement by Fair Work Australia. 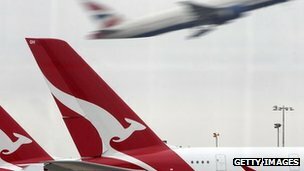 On 29th October, Qantas grounded their flights affecting 80,000 passengers all around the world. Their deadline to make an agreement was 21st November (today). Newsflash for blog readers: Both Dave Clarke and Chris Holland will be returning to Holbrook later this (school) year! Mr Clarke will be returning in January to tell us more stories. Key Stage One classes will be involved this time and I know they will love hearing the stories from a real Australian. He is also coming to school on Australia Day (you can look up the date) to help us celebrate… or maybe that should be ‘we will help him celebrate’. The Didgeridoo Man is returning in June to work with Year Six pupils on their legacy work of art for our school grounds. The artwork will have Aboriginal influences. We shall be holding a Corabee as part of the opening or unveiling. If you do not know what a corabee is, look it up… and then tell me because I don’t know either. I do know that Chris Holland suggested it so it is bound to be fun! Earlier this week, Qantas airline boss decided to stop all the Qantas planes from flying. He decided this because it was necessary after some staff strikes were costing Qantas nearly £10 million pounds. Because of this decision nearly 70,000 people have been affected in 22 different countries. If I was one of the people stuck in Australia I would feel really angry, bored and sad. I wouldn’t be able to get home. The Queen and the Duke of Edinburgh went to Australia together. They went for an 11 day tour, the 16th time the Queen has been to the country. They started in Canberra. The Prime Minister of Australia greeted them. She is called Julia Gillard. The first day they went to Government House for a tour. The Queen also did a speech there. She took a boat to a flower show as her first public appearance. Loads of people came to see her and cheered as she went by. To get to the flower show, she went down the Capital Central Lake. She said she would also like to go around Melbourne and Brisbane as well as Canberra. She presented the Australian Royal Military College with a new set of royal colours. Would you like to be the Queen and visit lots of faraway places? Do you live in Australia and, if you do, have you seen her yet? Brisbane: They took an hour-long boat trip to get to Brisbane. They went down the Brisbane River which happened to have flooded in January, destroying hundreds of homes. The royal couple had gone to a private party for all the emergency workers who helped with the flood. Melbourne: Thousands of people came to see the Queen. In Melbourne, she attended a hospital opening, took a gallery tour, went to a government house reception and had a tram ride. After doing all that in four hours she flew up into Perth in Western Australia. 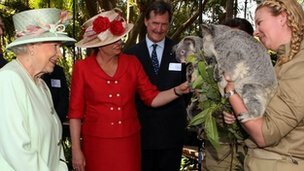 Perth: The Queen said goodbye in Perth. There was a big fete there and there were musicians and lots of speeches. In her speech she said it was the perfect way to say goodbye. She also said she will have many fond memories of her visit and she thanked the people for the warm welcome into their country. After the speeches they had a lovely barbecue and they said hello to some of their fans. They were given lots of presents and the Duke of Edinburgh even tried to barbecue with some of the cooks. Law: While the Queen was in Australia, a very important decision was made. The decision was that princes and princesses should have the same right to be next in line to the throne. So that visit to Australia is now a very important bit of history.